What does the Internet of Things have to do with healthcare? Not much, we thought – but were soon to know better, thanks to winning two Gold Passes (thank you, Doctorpreneurs!) for the event, which was held on June 13 and 14 at the berlin congress center. Being doctors and entrepreneurs ourselves, we were quite curious to attend an event that doesn’t feel very much related to our daily work. The 5 big topics of the IoT Tech Expo were Developing & IoT technologies, Connected Industry, Smart Cities, Connected Living and Data & Security. Along with an exciting exhibition there was a continuous stream of keynote speeches and panel discussions, which gave us an insight into a vibrant innovative industry. Talks were given on relevant business topics such as business models for IoT tech, smart product development, promising markets and strategies for startups and much more. Although medicine has always been an innovative area, the fast pace of development and millions of new products and services in information technology makes healthcare looks old. But times they are a-changin’. Among the hundreds of interesting companies, products and services we’ve seen, we’d like to point out a few with direct relevance to healthcare. BrainControl (braincontrol.it): The Italian company developed an assistive device for patients with impairment of physical movement, such as amyotrophic lateral sclerosis (ALS), multiple sclerosis, traumatic or ischemic injury, including patients suffering from locked-in syndrome. 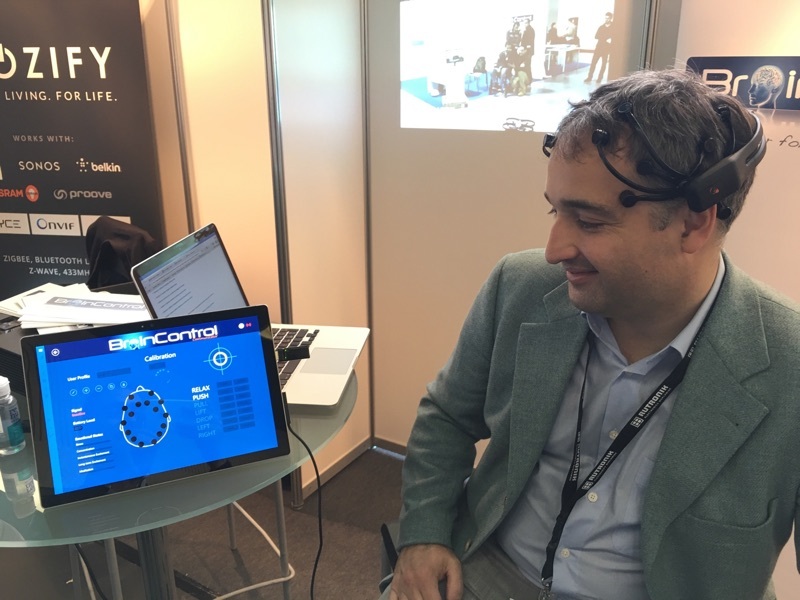 The impressive device, which the company’s CEO Pasquale Fedele offered us to try ourselves, is a brain-computer interface which detects and interprets EEG signals associated with certain cognitive activities. Electrical signals from the brain are read using a mobile EEG, that is as easy to fit as sunglasses. The system then interprets thoughts related to the intention of movement, such as forward, back, left, right, etc. and uses the same brain signals that we create when we move parts of our body. These signals are present even if someone has lost the ability to actually move their muscles. After initial calibration during which the system gets to know your specific brain activity patterns, it was very easy for us to control a dialogue screen on a computer and answer questions such “How do you feel” and give “Yes/No” answers. The accuracy of the system allows a patient to control a wheelchair, use home automation technologies and also communicate using a virtual keyboard. We’ve seen the device being used by various visitors, and it worked impressively well with each person. 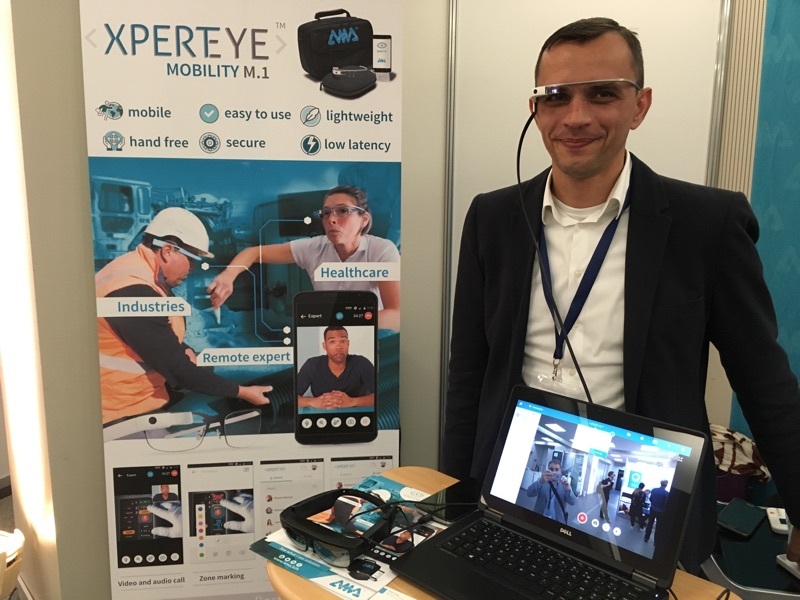 XPERT EYE (http://www.ama.bzh/en/xpert-eye/): The company, an official Google Glass Partner, developed a mobile tele-expertise solution which can be used with all kinds of smart glasses, not just Google Glass. The glasses can record and transfer live video to any smartphone, laptop or desktop computer and gives a medical professional great freedom in telemedical applications. Doctors and nurses can use the system as a tool for remote assistance, in which the physical presence of the doctor is not required, but who can assist the nurse at the point of care, such as the patients’ homes, and guide from the medical office or hospital. In our conversation with the company’s team, they mentioned that the system is also being used in the field of emergency medicine in the city of Nantes, which improves the care of critically injured persons. Other use cases include assisted surgery, in which remote experts can assist directly in the operating room as well as medical training. The third technology that impressed us was a device that is able to measure the heart and breathing rates non-invasively and remotely. It is using radar waves that bounce off the patient’s body. Moving objects (in this case the patient’s chest movements and the beating heart) cause a shift in the phase of the electromagnetic waves, which is known as the Doppler effect. By measuring and analyzing these changes, the device is able to calculate your heart and breathing rates. While in theory, this makes a lot of sense and the demo device was indeed giving readouts, we weren’t too impressed by the quality of the data. Still, with the necessary quality improvements and clinical validation, the technology could make a lot of sense in monitoring patients in a clinical setting. 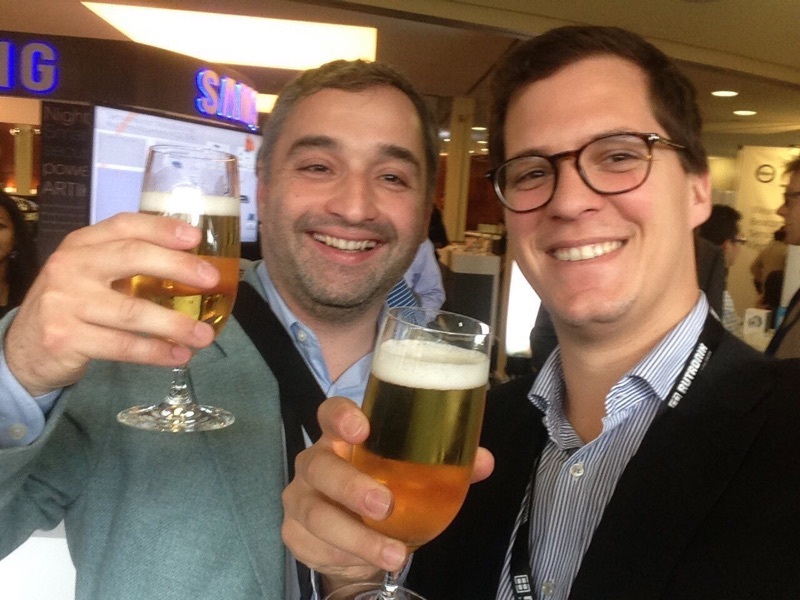 After all, it being held in Germany meant great beer on tap, and in this case offered complimentary to all guests. So, doctorpreneurs, anyone out there looking for a great idea? Even though the IoT was not at all a medical exhibition, we’ve spotted interesting technologies that can potentially make a lot of sense in healthcare. But not just that. It also shows that it needs a doctor’s mindset when working with technology driven companies. Doctors know the healthcare system and its processes in such great detail that they can identify areas of improvement and work together with engineers to deliver just that – an improvement of their quality of work and the experience of the patients. Today’s opportunities and technology offer doctors new areas in which to engage beyond (or in addition to) patient care or research and we, as doctor entrepreneurs, would like to see more of our colleagues join us in entrepreneurship. Karl is a medical doctor from Germany with a long background in translational cancer research. As a doctor-entrepreneur, Karl has founded Quint Healthcare, a specialized medical consulting company which focuses on innovative technologies. Karl and his team help startup and grown-up companies develop innovative healthcare services and products. Miguel Nunes graduated in Medicine from the Universidade da Beira Interior, having concluded his specialty in Stomatology, at Centro Hospitalar Lisboa Norte, where he works. He was always interested in the business world and entrepreneurship, having founded Blocomed®, in order to bring to the market a surgery kit he developed for health students. He is also a member of the medical team of Patient Innovation, an open platform for patients and caregivers to share solutions they developed to help them cope with the challenges imposed by their disease or health condition. We will soon have a competition up and running for winning gold passes to the Internet of Things tech expo in North America 20-21 October. Join our community of healthcare entrepreneurs to be the first one to know all about it!